cryptonaut-in-exile: Two Ted Williams items discovered because I wondered just now whatever became of his severed head. Two Ted Williams items discovered because I wondered just now whatever became of his severed head. 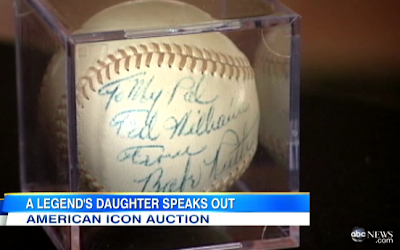 "To My Pal Ted Williams From Babe Ruth"
She points out that her father had a life-long obsession with science. Indeed, he authored what is considered one of the definitive blueprints for baseball success, "The Science of Hitting." "My dad was a man of science," Williams says. "He wasn't a religious man. I can't apologize for that. He didn't believe in god. He believed in science." Warms the cockles of my atheist heart. Also, that baseball ... wow. 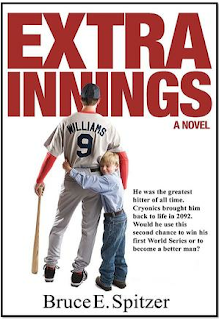 The idea for “Extra Innings” was born six years ago out of a marriage between two of Spitzer’s loves — baseball and history. He was watching a Red Sox game one night, during which Jerry Remy and Don Orsillo were discussing Williams. Channel surfing through a commercial break, he flipped to a show about mummies and the afterlife. It would be great, he thought, to combine William’s cryogenic freezing with the question of life after death. In his mind’s eye, he pictured what Williams would be like if ever unfrozen. Unfrozen and, one hopes, his frozen, tragically abused, severed head repaired.